This Week: An artist collective skewers Trump… How Florence’s Uffizi is dramatically addressing its problems… Our fetishizing of “authenticity” doesn’t ring true… So what if Google is changing the way you think… An inspiring comeback after medical calamity by one of America’s best musicians. Inspiring Story – How One Of America’s Best Musicians Got His Groove Back: Oboist Alex Klein had ascended to one of the top jobs in the orchestra world – principal oboist of the Chicago Symphony. Then calamity. He lost control of his fingers while he was performing. “The insidious thing was that when he was away from the oboe, his fingers worked just fine. It was only when he performed that his fingers got confused and stiffened. Practicing longer and harder only made the task-specific disorder worse.” He quit the orchestra and spent arduous years trying to treat the problem. He succeeded. Not only that, when his old job became available again, he auditioned. Read his inspiring story in the Chicago Tribune. Vile & disgusting. 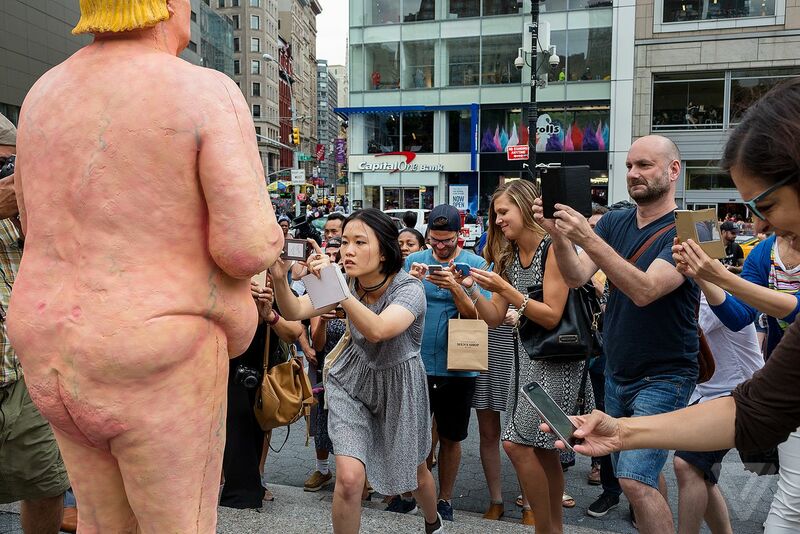 This is not art nor it is political commentary. This is the second time in as many weeks Arts Journal has trashed Trump. I come here for news about classical arts and I am faced with this rubbish. I will not be back and will be changing my party from democrat to independent if this is the level liberal politics has sunk. The Trump piece was one of the biggest arts stories last week and got lots of attention. We linked to several stories, including a fierce attack on the work as not being good satire, commentary or politics. Sorry you were offended. I suspect your reaction was something the artists were hoping for. Political debate in America is broken and has descended to levels we haven’t seen in a long time. Shining a light on the debate and calling it out when we disagree is surely one of the first steps to restoring a higher level of political discourse.